In amongst the 9 boats competing in the FSC Silver Sunbeam Race, the Firefly SW championships hosted by RSC, the Marieholm & IOD Champs out of SMSC, a pilot gig event in St Mawes, squadrons of the Birmingham Navy and the 8 Working Boats appearing for the FSC hosted Feety Spear race, all seemingly using Channel 72, Race Officer Mike Maguire managed to set a great course of 7.3 miles for the 5 boat U Class fleet and a shorter course for the 5 gaffers. Our normal weather forecaster is absent on holiday so my summary of the conditions was “it was nice” – cloudy with a light/medium breeze. With a classic westerly blowing down the harbour, positioning on the start line was keenly fought over to get the best running angle with Mandy Owens helming Aurora off the line in the quickest order followed by the two GK24s of Bob Chapple's Wilkie and Nigel Rowe's Kaimana following in short order. Tim Dewhurst on his Hawk 20 Mr G and a subdued Deep Purple helmed by Ron Jones followed. A good run down to Rustler saw Aurora surprisingly ahead of the quicker GK24s, then a beat to Trefusis with Wilkie & Kaimana moving into the lead on the water but both went off on the wrong direction on the kite hoist for the broad reach to Vilt which allowed Aurora to get back to second. A gybe on to a tight reach towards Lugo became tighter near the East Narrows and the running Sunbeam fleet, forcing Wilkie to drop her kite but Aurora managed to hold her smaller kite to make a gain on the lead. 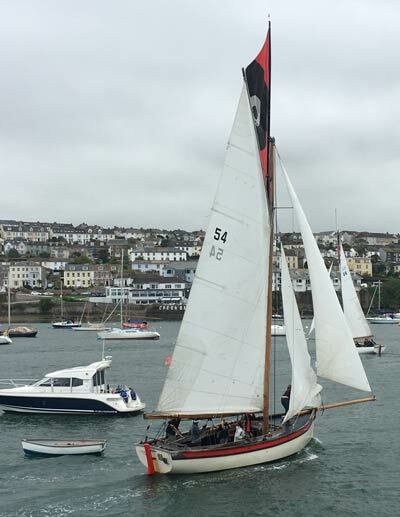 The run into St Mawes was interesting for the three lead boats with the phalanx of Pilot Gigs piling out in their race – no quarter asked or given! A difference of opinion on which side to tack out of St Mawes saw Wilkie make a significant gain on Aurora but this was again reduced in the slightly fresher winds up to the Governor where U Class joined in with G Class for a bit of company. Next a run to West Narrows in the “course that takes in all marks” saw Aurora make a further small gain on Wilkie with implications for the overall handicap result. A long beat predominantly on port back towards the turning mark saw Wilkie on a slightly more favourable lift than Aurora who in turn was higher than Kaimana. Fortunately the Race Officer, who has a strong reputation for liking long races, decided to shorten the race and finish us at the Club after 110 minutes racing. Wilkie won on the water, followed by Aurora, Kaimana, Mr G and a distant Deep Purple. After application of both IRC and the Byron handicaps, Aurora won followed by the smilers on Wilkie and the gigglers on Kaimana, then Mr G was fourth under Byron followed by Deep Purple. 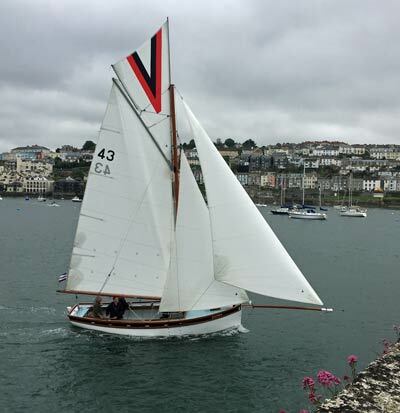 p> Five Gaffers – Charm, Clementine, Delilah, Katy & Miss Agnes, emerged for a good and enjoyable race again managing to avoid all the other sailing fleets, gigs etc. Whilst results are still to be calculated Katy won on the water and good to see the happy fleet in the Clubhouse afterwards. Editor's note: Katy did win on corrected time, followed by Nick Bradley's Charm. The Sunbeams held their annual Silver Sunbeam Race which was first sailed for on 29th May 1924. Nine boats came to compete. The fleet enjoyed a beating start out in the Roads, Race Officered by Jack “Yoda” Penty on Noon Hi. 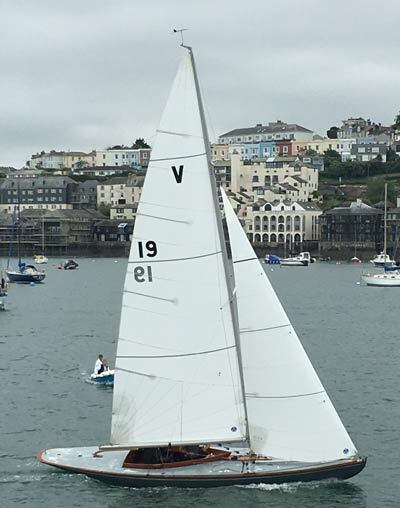 Stuart Sawyer and Roger Ford in V19 Audrey had a strong start pulling away on each leg to win the prestigious Silver Sunbeam from 2015 winner Nigel Glanville and Mike Stratton in V3 Ivy followed by last year's winners David Mantle and Simon Perkins in V5 Whimsey. Prize-giving was held in the Clubhouse after racing with many admiring glances of the beautiful glass cased trophy. Despite rumours of the fleet enjoying Babycham™ spritzers and snowballs they actually made a really good dent in the barrel of Lushingtons and it was great to see them out in force. The Clubhouse had a lovely post racing atmosphere with cakey tea provided by Nina Richards with a fab carrot cake and marvellous flapjacks. Finishing was undertaken by Andy Platt and Paul Williams. Results were calculated by Inez and Jeanette and the bar run by Charlie and John.